Gift-giving anxiety. It's an affliction we all feel once in a while. As the holiday season gets closer the budget gets smaller and yet the list of gifts grows longer. This year we'd like to introduce you to a fun and easy way to make your own fun gifts for friends, colleagues and neighbors that won't cost the bank, but will look awesome. This, my friend, is the art of the Gift Jar. Yes, you can put more things in a jar than just jam. Here are some of our favorite ideas for this season. You can create these by simply saving old food jars over a couple months, adding ingredients and some finishing details. - Hot Chocolate Jars. Simply layer cocoa mix, marshmallows and maybe a few chocolate bits or candy cane pieces in a jar. Tie or stick a sampler size of Bailey's cream liqueur to the side and voila! A gift anyone (of legal age) will love. - Hand Scrub Jars. This is particularily popular among ladies. 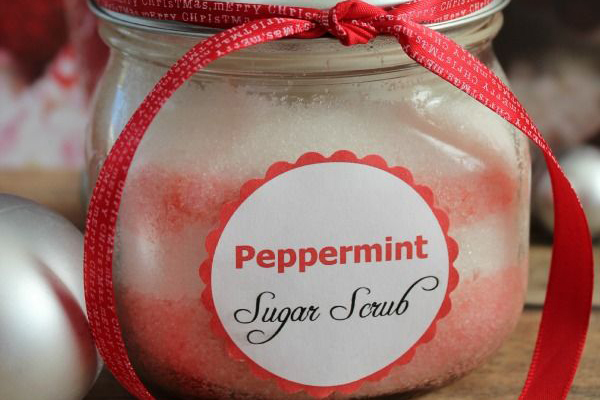 DIY your own scented hand scrub and pack it into a jar. It can be used to wash and exfoliate hands and feet. They will love how soft and good their hands feel afterwards. 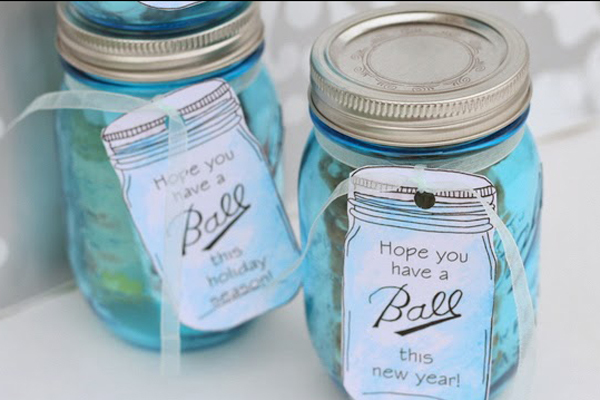 - Holiday Snow Globe Jars. Fill the jar with water, a bit of glitter and some coloured beads. Then glue a snowman figuring or other holiday themed figurine to the underside of the lid. Screw the lid on tight and give it a shake to see your winter wonderland in a jar. - Candy Layers. Know someone with a sweet tooth? Layer a jar with a couple of their favourite candies and you have a quick and colorful gift. Kids will love this. - Mulled Wine Jars. This one is great for those who enjoy hot spiced beverages around the holidays. Create your own mulled wine. Add wine to jars. Add a couple hunks of fruit or whole spices and you're finished. - Manhattan in a Jar. No wine drinkers? Manhattan in a jar is the perfect alternative for those classy folks who enjoy sipping on something a bit stronger. Create a batch of the beverage, then divide up among a couple jars and distribute. - Spa in a Jar. Pick up some sampler sizes hand creams and eye creams, add a nail polish, nail file and clippers, plus a colored loofah and you have a mini spa in a jar. This pampering gift will be appreciated by those hardworkers on your list. - Date Night in a Jar. Know a cute couple who would enjoy a night out? Pick up some tickets to a show and add some other trinkets and you are set. A gift they can use together. - Salt and Pepper Jars. Have a friend whom likes to cook? Use smaller jars as spice jars and poke holes into the top so the contents can easily be shaken out. If you have a secret pork rub you don't want to share, this is a great alternative. They can enjoy it at home without getting your top secret recipe. 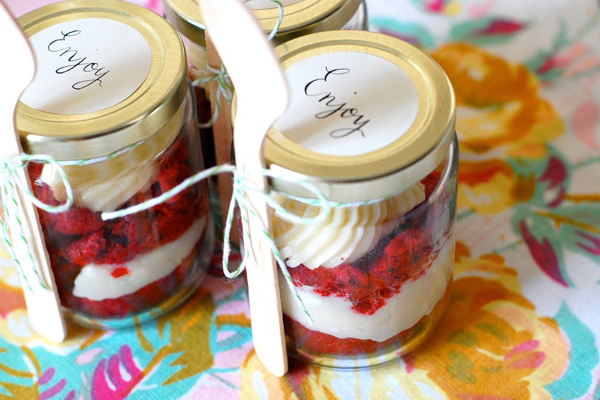 - Dessert in a Jar. Famous pie recipe? Share the joy by creating little pies in a jar. Then bake and distribute. Can be done with any dessert and is perfect for creating individual serving sizes. - Soap in a Jar. If you create your own soap, or would like to give it a try, this will make a great gift. Simply add balls of the soap to a jar. They can use them as they please and keep the rest well stored. - Candle Jars. Attach a wick to the bottom of a jar, then fill with layers of melted coloured scented wax. Let harden and pop the lid back on. This aromatic gift is great in any home. - Terrarium Jar. All you have to do here is add some pebbles to the bottom of the jar, then root some small low maintenance plants and moss. They do not require much work and will add some greenery to any space. - Potpourri Jars. Add some dried flowers, fruit and other scented herbs to a jar to create your own potpourri jars. Stretch some patterned fabric across the top and hold in place with an elastic or tied string. Then add the lid. Once the lid is removed, the scent will be released through the fabric seal. 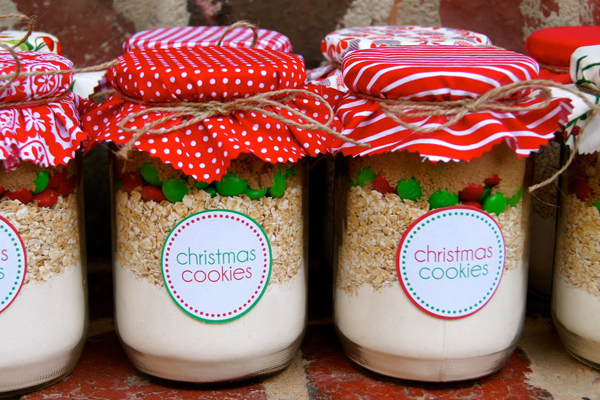 - Homemade Granola or Cookies in a Jar. whipping up a batch of trail mix, granola or cookies is an easy way to fill a jar. Everyone loves a snack. - Flavoured Vodka in a Jar. Create your own flavoured vodka for your friends to use over the holidays. Candy Cane vodka is a popular choice that tastes great in hot beverages. 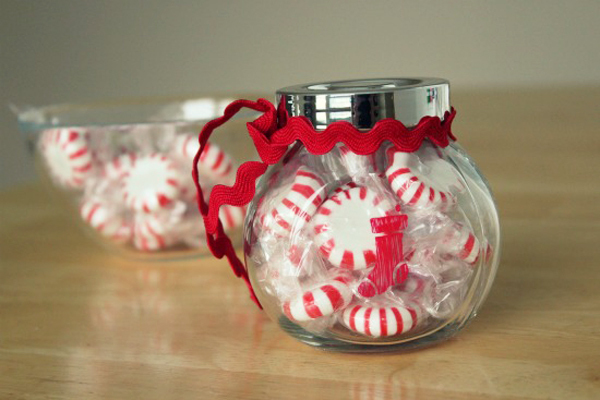 Simply add candy canes and vodka to the jar. - Bath Fizzers in a Jar. Know how to create your own bath bombs from baking soda? Create a couple to add to a jar. Great for anyone who enjoys lounging in the tub. - Sewing Kit Jars. Add some spools of thread, needles, generic buttons, a pair of scissors and a pin cushion with pins to a jar. Anyone who likes to sew or patch up clothing will appreciate and use this handy kit. The Nothing Jar. Did you ask someone what they would like for the Holidays only to have them reply with "Nothing"? Well you heard them. Stick a label on an empty jar and give that to them. Lesson learned. Empty, clean jars of any sizes and shapes with matching lids. Some coloured ribbon twine, or bows. Custom labels, stickers, or temporary tattoos from StickerYou. You can create and customize them to match colours, names, any sizes and more. They will add a more high quality finish to your gift jars, and they are waterproof, heat resistant and dishwasher, microwaves safe.